A thorough knowledge of modern connection-oriented networks is essential to understanding the current and near-future state of networking. 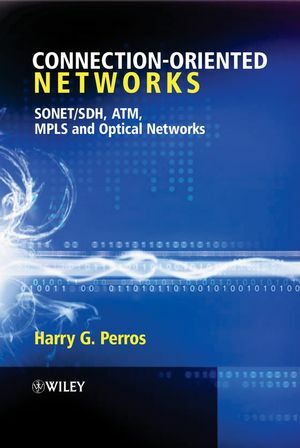 This book provides a complete overview of connection-oriented networks, discussing both packet-switched and circuit-switched networks, which, though seemingly different, share common networking principles. It details the history and development of such networks, and defines their terminology and architecture, before progressing to aspects such as signaling and standards. There is inclusive coverage of SONET/SDH, ATM networks, Multi-Protocol Label Switching (MPLS), optical networks, access networks and voice over ATM and MPLS. Senior undergraduate and graduate students in telecommunication and networking courses, as well as networking engineers, will find this comprehensive guide to connection-oriented packet-switched and circuit-switched networks useful for their training. The book presents tried and tested material based on an existing, successful course. Harry G. Perros is a Professor of Computer Science, an Alumni Distinguished Graduate Professor, and the Program Coordinator of the Master of Science degree in Computer Networks at NC State University. He received the B.Sc. degree in Mathematics in 1970 from Athens University, Greece, the M.Sc. degree in Operational Research with Computing from Leeds University, England, in 1971, and the Ph.D. degree in Operations Research from Trinity College Dublin, Ireland, in 1975. He ahs held visiting faculty positions at INRIA, Rocquencourt, France (1979), NORTEL, Research Triangle Park, North Carolina (1988-89 and 1995-96) and University of Paris 6, France (1995-96, 2000, and 2002). He has published numerous papers in the area of performance modeling of computer and communication systems, and he has organized several national and international conferences. He has also published two print books: Queueing Networks with Blocking: Exact and Approximate Solutions, Oxford Press 1994, An Introduction to ATM Networks, Wiley 2002, and an e-book Computer Simulation Techniques - The Definitive Introduction, 2002 (available through his Web site). In 1995, he founded the IFIP Working Group 6.3 on the Performance of Communication Systems, and he was the chairman from 1995 to 2002. As of 2004, he is the chairman of the IFIP Working Group 6.10 on Optical Networks. He is also a member of IFIP Working Groups 6.2, and 7.3, and an IEEE Senior Member. In addition, he is an associate Editor for the Performance Evaluation Journal, and the Telecommunications Systems Journal. His current research interests are in the area of optical networks. In his free time he likes to go sailing on the Aegean, a Pearson 31! 2. SONET/SDH and the Generic Frame Procedure (GFP). .
4. Congestion Control in ATM Networks. 5. Signaling in ATM Networks. 6. The Multi-Protocol Label Switching (MPLS) Architecture. 8. Optical Fibers and Components. 9. Wavelength Routing Optical Networks. 12. Voice Over ATM and MPLS. Connection-Oriented Networks Visit the companion website for access to a range of supplementary materials.